The Thanksgiving Writing Prompts (by The OG in DOG) are a fun writing prompt for the holiday season. They offer students brainstorming ideas to create either a realistic fiction story or an opinion essay related to Thanksgiving. 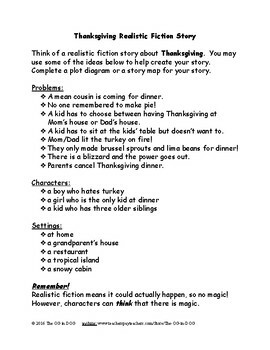 Included: 1 page Thanksgiving Realistic Fiction writing prompt with story starters and ideas, and 1 page Thanksgiving Opinion writing prompt with story starters.